After four months of being raised in a fish pen in Dana Point Harbor, 1,102 white seabass were released into their new home: the open ocean. Sportfishing Financial Group, an investment and financial advising company, has been voluntarily coordinating efforts to raise juvenile white seabass and release them. The group works in collaboration with Hubbs-SeaWorld Research Institute, the California Department of Fish & Wildlife, Sportfishing Association of California and Coastal Conservation Association of California to carry out the Ocean Resources Enhancement and Hatchery Program (OREHP) — a 30-year program. OREHP works to assess the biological and economic impacts of its releases. Each juvenile white seabass is tagged internally in the cheek with a 1 millimeter-long, stainless steel coded wire tag. Volunteers are responsible for feeding the batch of fish twice daily. The larvae for the most recent batch arrived in early February. 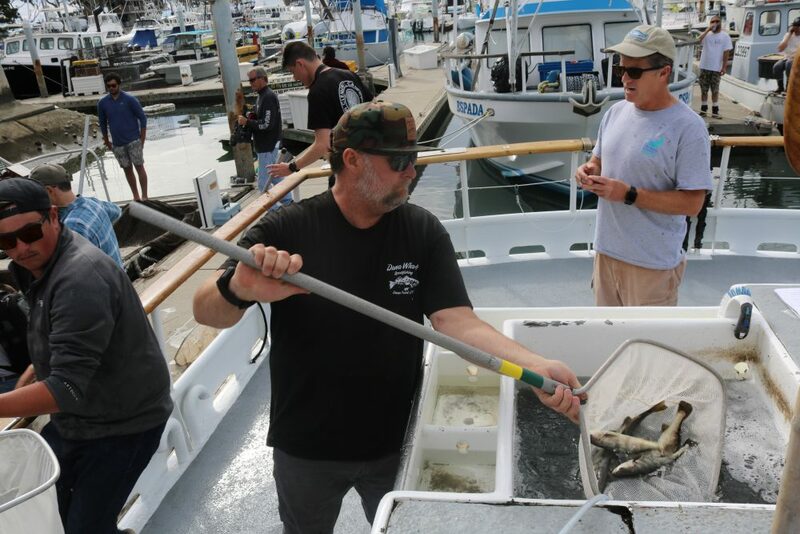 Rick Jensen of Sportfishing Financial Group says that in previous years, after the juvenile seabass had developed, they would be released directly from their pen in the Dana Point Harbor. On Thursday, April 4, volunteers used nets to scoop the fish from the pen and onto containers aboard Sum Fun and Clemente. Each vessel made two trips in order to transfer all 1,102 white seabass. Researchers with HSWRI ask those who fish adult white seabass to freeze their heads with the stones and ear bones intact. HSWRI will scan donated heads for internal tags and collect the appropriate age and genetic stock information. The tags provide information on movement, diet, growth and the survival rate of hatchery-reared seabass. Heads should be bagged and labeled with your name, phone number, date and location of capture. Frozen heads can be dropped off at Dana Wharf Sportfishing & Whale Watching or at Hogan’s Bait & Tackle.